David Potts received his initial training in photography in 1945 through the Commonwealth Repatriation Scheme, after leaving the RAAF. He found subsequent employment in the Medical Illustrations Department at the Sydney University before moving on to the world of commercial photography a year later. Working in the Sydney photographic studios of Russell Roberts (1947-79), Laurie Le Guay and John Nisbett (1950), Potts gained experience in advertising and fashion, however, it was the burgeoning documentary photography movement that captured his interest. As a wry social observer, perceptive to the scenes of life unfolding before him, Potts proved well suited to this mode. Like close friend David Moore, Potts aspired to make a living from his personal style of photography and relocated to London in 1950 hoping to realise this through opportunities in photojournalism. Over the next four years Potts completed assignments in London, Cyprus and Israel with images published in ‘The Observer’, ‘Life’ and ‘Picture Post’. Created during his time in London, ‘Part of a mural at the South Ban’k and ‘Piccadilly Circus’ are evidence of a confident young artist exploring the possibilities of his medium. Bold in colour and design, these vibrant experiments in abstraction are suggestive of the liberation and adventure of a new life in London. Potts played with a combination of shutter speed and movement (revolving the camera-back) to create ‘Piccadilly Circus’, while the abstract composition of ‘Part of a mural at the South Bank’ was realised by isolating a detail of a larger form. Returning to Sydney in 1955, Potts exhibited the images in the ‘6 photographers’ group show held that year. Alongside a selection of his documentary images these two colour photographs were presented within a group of six dye transfer prints that Potts described as ‘part of a series experimenting with colour and attempting to depict a city in a new manner’ with a working title of ‘Surrealist in the City’ (later referred to as ‘the London series’). From 1955 onwards Potts focused on black and white documentary photography. Through the early sixties Potts operated his own studio and in 1966 contributed photographs to the book ‘Australian outrage: the decay of a visual environment: a study by the Royal Australian Institute of Architects’. 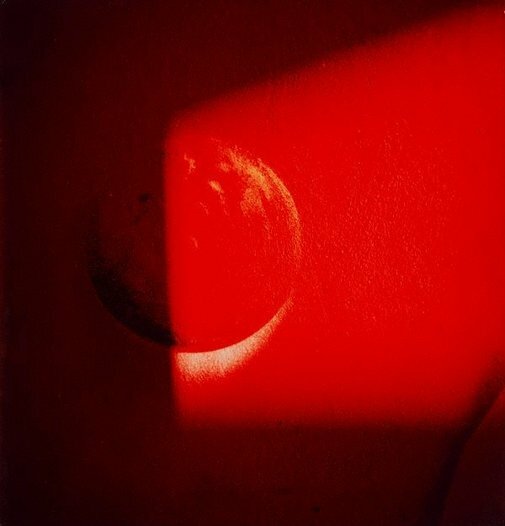 The 1990s saw Potts return to colour photography and his interest in abstraction, as presented in solo shows in 2000-1. Signed and dated verso timber backing board, black ink "... 1953/ .../ David Potts". Signed u.c. verso, black ink ".../ David Potts" and l.r. mount, black ink "David Potts".